Making a book cover and getting it ready for upload will vary depending upon the service you have chosen to publish your book with, however, some of the most popular self publishing services will use templates to ensure that the size of your design is correct. Now these templates may look a little confusing (if it’s the first time you’ve seen one), but they really are there to help you in creating a PDF ready for upload. 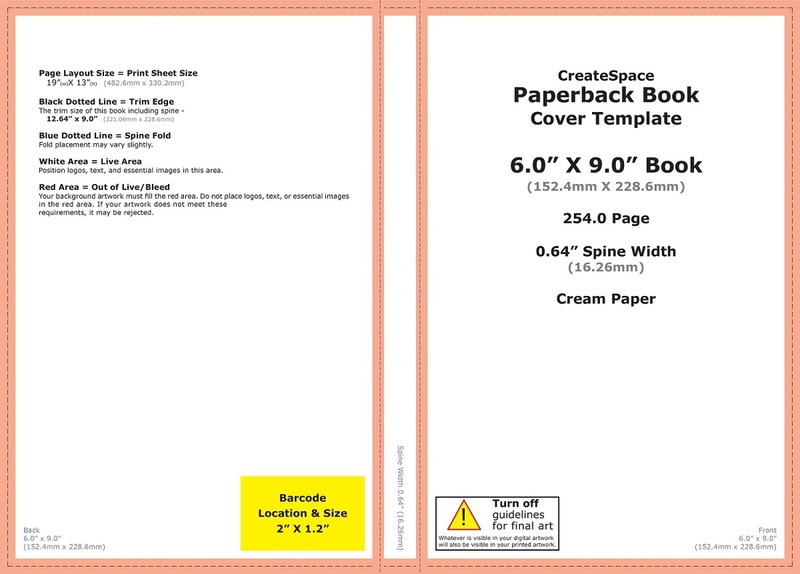 The most common book cover design template is from Createspace and is easily downloadable from their website, it will ask you several simple questions first of all, these are based around the interior type of your book, the trim size, paper type and of course the page count. Once those details have been added simply click ‘build template’ and it creates a PDF and PNG file based around your details. This you can now load into Photoshop and InDesign to use as the base layer for your book cover, the great thing with this book cover template is that it gives you the margins, bleed, fold lines and trim marks (however, I would always strongly recommend that you measure out your lines and mark using adobe’s guidelines too, also, when it comes to margins I have found that a minimum of 7 mm ensures that you keep clear of the fold line where the pages are glued). Using as a layer within your software you can ensure that your design fits and that elements such as the barcode and copy are correctly sized and placed. You will also notice that you have margins within the spine of the book too, these are normally just less than 2 mm and can limit the size of text (depending upon page count) it’s important that you stay within these margins to ensure acceptance. When it comes to the placement of your text it’s important that you locate the center of both the front and back pages, this may sound obvious but if you measure between the edge of the spine and the bleed line then your center will be off, you need to measure from the spine edge to the trim line to work out the center of the page (remember, the area between the trim line and bleed line edge will be cut off when the book is trimmed to size). Once you have built your book cover then you’ll need to ensure that you turn off the layer which holds the template (you really don’t want it printed upon the book cover itself). Another popular template provider is IngramSpark, they give far more options when it comes to sizes and also cover types (such as hardback and dust jackets), their templates however are larger than those of Createspace and require a little more information to create. From their website you’ll need to know the book’s ISBN, trim size, interior color, paper type, binding type, laminate type and page count, enter in your email address and they’ll send the template to you as either a PDF of an InDesign file. Downloading as an InDesign file will bring up the template with the guidelines locked in place, this makes creating the book to the correct size far more straight forward. 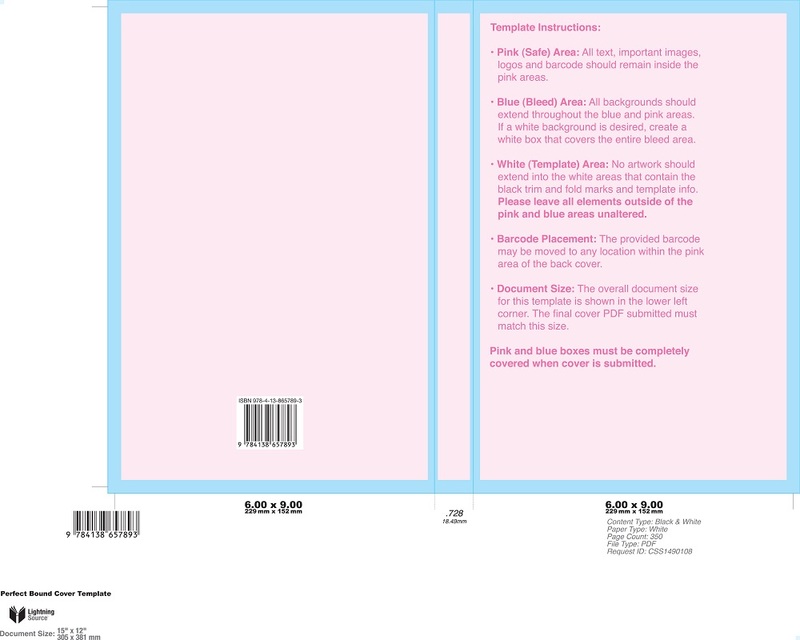 Both options are very straight forward to use but have some differences, such as in Createspace you can design in RGB but with Ingram Spark it needs to be in CMYK color (normally with the ink levels set at no more than 240%), also with Ingram Spark you need to save the completed design with the ISBN as the file name, you will also create the design without using additional bleed lines to the overall document (they’re taken care of within the document itself). However, when you’re exporting as a PDF you’ll need to ensure that neither of them have any printers guidelines turned on, that their fonts are embedded and that you don’t add any security to the file (such as passwords). Publishing a book as an author can seem a little confusing, there are lots of things to focus on and even if you have published a book before, it can still be time consuming and hard work knowing what to do in order to be successful. So wouldn't it be great to have the advice and experience from someone who's published many novels already, an established author who is successful and can use their experience and success to help you too? Paul Teague is a successful and established author with many titles published and as such has a self-publishing academy drawing on his experience to help you become the successful author you deserve to be, a jargon free step-by-step guide which will ensure you have a clear path to success as an Indie author.